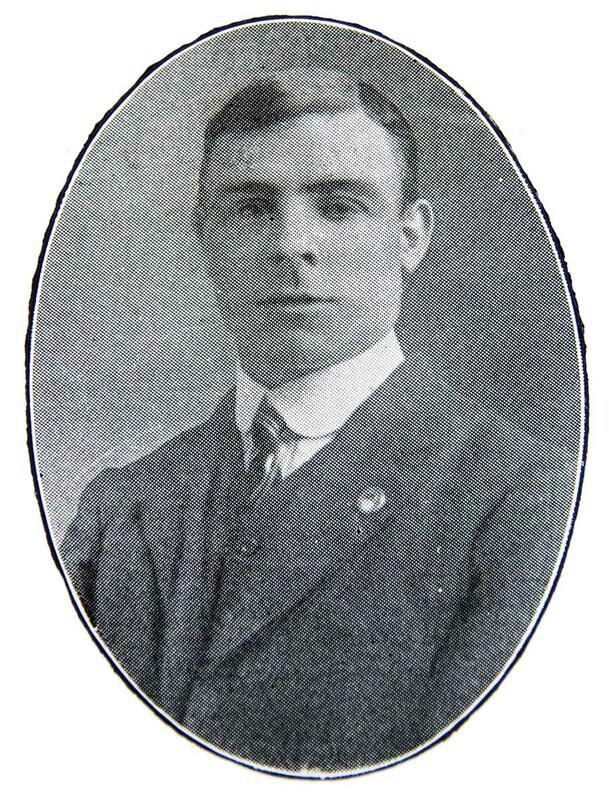 George was born in Newbury in 1885, the son of David Herbert and his wife Sarah née Foreman, formerly Grigg. His father had married Sarah following the death of her first husband, John Grigg, with whom David had served in the 7th regiment of Foot. David himself died in 1892. Sarah and David had four children (David Percival, Elizabeth Harriet, Charles William and George Henry) to join Sarah's two sons (John and James) from her first marriage. Both John and James joined the Royal Berkshire Regiment, first as local militia volunteers and then as regulers, which took both brothers to South Africa during the Boer War. In 1892 David died, leaving Sarah a widow for the second time until, in 1899 she married for a third time, to Edward William Woods. Young George opted to follow the family example and enlisted in the Royal Berkshire Regiment. He was posted to their 2nd Battalion stationed in India, where he served for eight years before returning to England and civvy street. Soldiers typically served terms of 12 years, part in uniform, part in the Reserve, so when war broke out in 1914 he was still in the Reserve and would have been called up immediately. 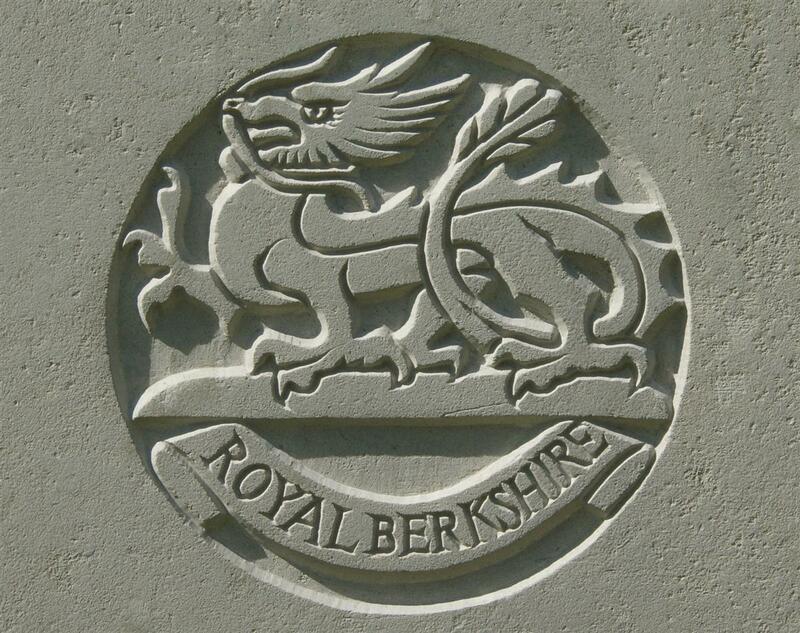 Unlike many of the Royal Berks Reserve called up in August 1914 he was not sent to France with the 1st Battalion, which was stationed in Aldershot at the time and hence was among the first battalions of the British Expeditionary Force to land in France. Instead he was sent to the 3rd (Reserve) Battalion in Portsmouth to await a the return from India of his old comrades in the 2nd Battalion. The 2nd Battalion landed in Liverpool on 23 October and proceeded to Hursley Park outside Winchester where the 8th Division was assembling. This Division was formed from units arriving in England from all corners of the Empire; the first arrivals from the Royal Berks were not the 2nd Battalion but a contingent (two officers and 179 other ranks) from the 3rd Battalion in Portsmouth, which may have included George. This group brought the returning battalion up to full strength in readiness for the move across the Channel to France. The 8th Division sailed to France the following month, the 2nd Royal Berks boarding their transport on 4 November. George did not land in France until 20 November, this might mean that he was among a draft of additional men, though he may also have been part of a detail left behind to undertakes some task or other before following the main body to France. Once the battalion was in France it was soon in action, they had suffered their first casualties before George arrived. The battalion spent a miserable winter, in and out of the line, but without major incident as both sides waited for better weather. In March the British went on the offensive at Neuve Chapelle, just south of the Franco-Belgian border. We marched out of our billet about 10:30 pm on the night of the 9th and proceeded to Neuve Chappelle about 6 mile away. We were served out with hot cocoa about 2 mile behind the firing line. At this spot was the last time I saw and spoke to my brother Tom. I never saw him again until I saw him at Portsmouth on May 14th 1915 after recovering from his wounds. Just before daybreak we found ourselves at Neuve Chappelle where we were packed into and behind the earthworks we had made while we were back resting. We used to come up every night and dig them it was not much of a rest but we did not mind we were all eager to get at the enemy. At any rate, when all was ready at 7.30am on the 10th the bombardment opened and oh! I shall never forget it seemed as if the world was made of glass and had fallen down and broken and all the devils in hell had been let loose. The faces of our men was terrible to look at, their eyes were flaming, oh! awful was their look, yet they were calm. The shells were dropping so close we were being covered by mud etc. At last one big one dropped right in amongst us it buried me and killed about 6 or 8 men and wounded a lot. I struggled out the best way I could, and when I did get out the sight that met my gaze I shall never forget, there were men cut to pieces dead and wounded all mixed up together, they were covered with blood from head to foot, there was about 4 places like this just by us, before we advanced. At last, at 8.05 am the artillery lifted their fire on to the village and then the order came to charge. Oh the feeling. We cheered the first line over shouting “Maiwand” and “Go on the Berkshires”. Men were falling like ninepins and the cry of the wounded and dying was awful but we took no notice, by now we were mad. Down came the order for us to charge, up we went and came up in line with the first line, oh! the sight: hundreds of dead lying in the first German trench. We jumped this and still on we went under a blinding machine gun fire from the left. After reaching and taking the third German trench I was ordered by the Colonel to take about twelve men back again to the old British trench and fetch up picks and shovels. I got hold of the men and took them back and brought as many as we could carry but by the time we got back I had lost 3 or 4 of my men. My Platoon Officer, Mr Saunders, such a nice gentleman and quite a brave man shouted to me “Down here, Sgt Hanks”. Knowing what he meant I at once ordered the men to lay down. I asked him if we should dig ourselves in where we were and he said “No”. He would go and find Capt. Harris who was to supervise the digging of the new trenches. He then turned away and took about 2 paces from me and was instantly killed, with a bullet through his brain. I, of course, was then in command of the Platoon and got to work under the orders of the Company Commander, Captain Townsend to dig in as fast as we could. Oh, by this time we had suffered heavy losses, both by Officers and Men. One particular Officer Capt. and Adjutant Alsworth laid alongside of us while we were digging shot through the heart. By this time I was exhausted and collapsed entirely with an injured back caused by being buried with a shell before the advance. Also I expect with shock. I rolled into a big shell hole the men continuously asking me where I was hit etc. One, poor old George Smith [9407 George Herbert Smith of Newbury], No. 13 Platoon Sgt. asked me where I was hit and about 2 minutes later his feet was hanging over the side of the hole. He was shot through the brain. At last the order came for more men to go back again for tools. I tried to pull myself together and get back with them which I did but when I reached there I could hardly move so I remained in the Old British Trench until the Doctor sent me back to the dressing station. By now I had learned that my brother had been killed but was unable to find out if he was or not. I reached the dressing station with Sergeant Major Godfrey, who had been wounded in the foot. The doctor sent me to the next dressing station where I was conveyed by the ambulance to number 26 field hospital, where I was examined and given Bovril, and conveyed to number 6 Clearing Hospital Merville where I stopped for the night. Mrs Woods, of 9, Market-street, who past Saturday, heard of the death in action of her youngest son, can produce a family record of patriotism of which she may well be proud. Her first husband, a corporal, served with her second husband in the 1st Royal Fusiliers, and came safely through severe fighting on the north-east frontier of India. By the first husband were two sons, both of whom survived the hardships endured in the South African War, and one [James Grigg] is still living. Pte Geo H Herbert, her youngest son, was in the 2nd Royal Berks, and did eight year’s service with his regiment in India. After his time was expired he was put in the Reserves. On the outbreak of war he was called to Portsmouth, where he was engaged in the officers’ mess room for nearly six months, when he left for France. He was killed at Neuve Chappelle on March 10th. His elder brother, Charles, is also at the front, having been with the Royal Engineers there for several months. George was buried in grave I.3 at Neuve Chapelle Farm Cemetery. 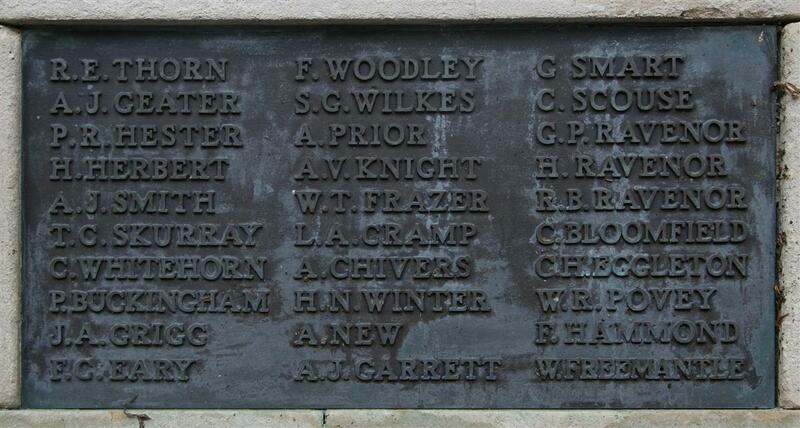 Locally he is remembered on the Newbury Town War Memorial (as H Herbert), the Parish memorial board and roll of honour (both in St Nicolas' Church, Newbury). His name may also be on the splendid memorial tablet in the URC Church, Newbury - as G Herbert, though this is somewhat more likely to be George William Herbert, who does not appear on the Anglican parish memorial in St Nicolas' - an indication of nonconformity. As mentioned in the newspaper article above, George's brothers, Charles William Herbert and James Aaron Grigg also served. James was deemed unfit for service at the front, instead he volunteered to serve in the National Reserve, where he became a guard of prisoners of war. His health eventually failed and he died of pneumonia in 1916, he was buried in Shaw Cemetery with full military honours. For his full story click. Charles survived the war. Thanks to Steve Miller, James Grigg's great grandson, for his input to this story.